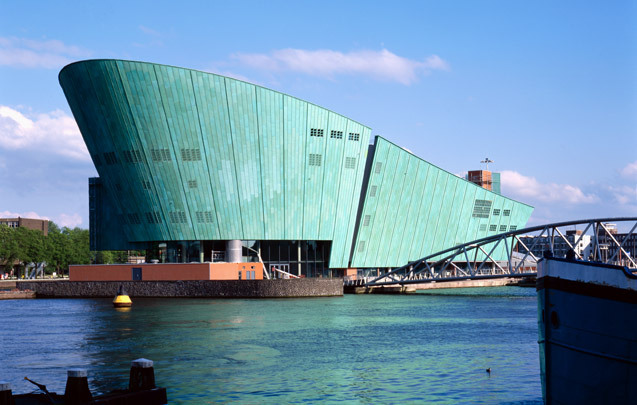 As the IJ Tunnel plunges below the surface, the roof of this science centre rises upwards. Its shape follows the curving course of the tunnel to terminate in a blunt jutting ‘prow’. The ship metaphor is enhanced by the cladding of semi-perforated copper panels fronting the toughened glass fenestration. Inside, there is a continuous open space with levels stepping up beneath the roof to contain exhibitions and other public functions. The raked roof itself is designed as a public plaza, offering visitors a wide view of ships in the eastern docks, the old town and the waters of the IJ inlet.